Citation Information: J Clin Invest. 2006;116(5):1310-1316. https://doi.org/10.1172/JCI21404. 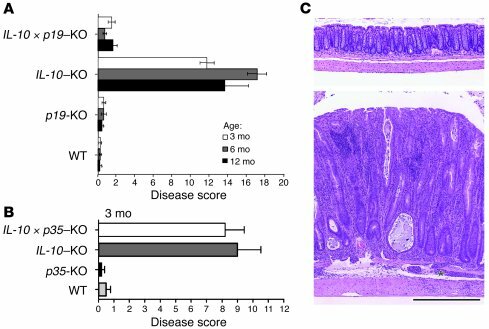 IL-23, but not IL-12, is essential for spontaneous colitis induced by IL-10 deficiency. (A) Histologic changes were evaluated at 3 time points in the colons of mice that were IL-10 deficient and/or IL-23 (p19) deficient. (B) Histologic changes were evaluated at 3 months in the colons of mice that were IL-10 deficient and/or IL-12 (p35) deficient. The disease scores for each group (n = 5–8) were obtained as previously described (41). (C) Photomicrographs of the descending colons from 12-month-old IL-10 × p19–KO mice (upper panel) and IL-10 –KO mice (lower panel). The lower panel shows marked mucosal thickening and epithelial hyperplasia. *Inflammation extended into the submucosa and tunica muscularis. Scale bar: 50 μm.